Update 10am 6 June: Cunard have posted this video clip of the 3 Queens arriving in Southampton yesterday morning. There are some good images in there. Update 10:30pm: the image alongside is a webcam grab from Queen Elizabeth just a minute or so ago, showing all three Queens. Queen Mary 2 is alongside, and Queen Victoria is straight ahead. Update 9:25pm: I gather that the rain persisted all afternoon and as a result the Red Arrows display had to be cancelled. But the fireworks display will go ahead as the three Queens line up and depart together. This should start around 10 o’clock, I believe. Well, I’m not in Southampton today so I’m not able to post anything about this myself. I’m restricted therefore to just posting links to other people’s web pages. First Sharon Poole (‘Host Sharon’ on cruise critic.co.uk) has posted this album on her Picassa site. She was obviously up very early to see the three Queens arrive, and her photographs show that it was well worth while. Captain Greybeard of the Daily Mirror, aka John Honeywell, was also up at the crack of something this morning getting pictures and words for his blog. He’s done two entries, this one and this one. Good images in both of them. It looks as if those who got up early (Sharon, John and the photographers John mentions) were rewarded with what I suspect will turn out to be the best shots of the day. Secondly, there are a couple of You Tube videos of the Queens saluting each other: this one and this one. There’s also a page on the BBC News website, with a brief video. 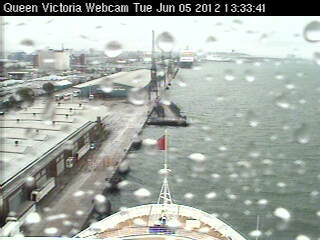 Finally (for now) it looks as if the weather is not being kind – that’s a grab from Queen Victoria’s webcam at 2:35pm.